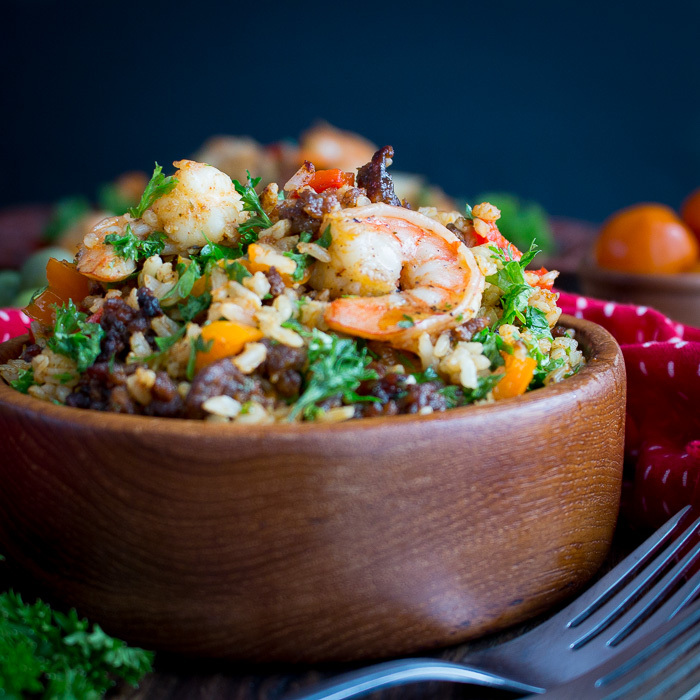 Chorizo and Shrimp Fried Rice is one super easy less than 15-minute one pan meal using leftover brown rice, vegetables of choice, spicy gluten free chorizo and shrimp. 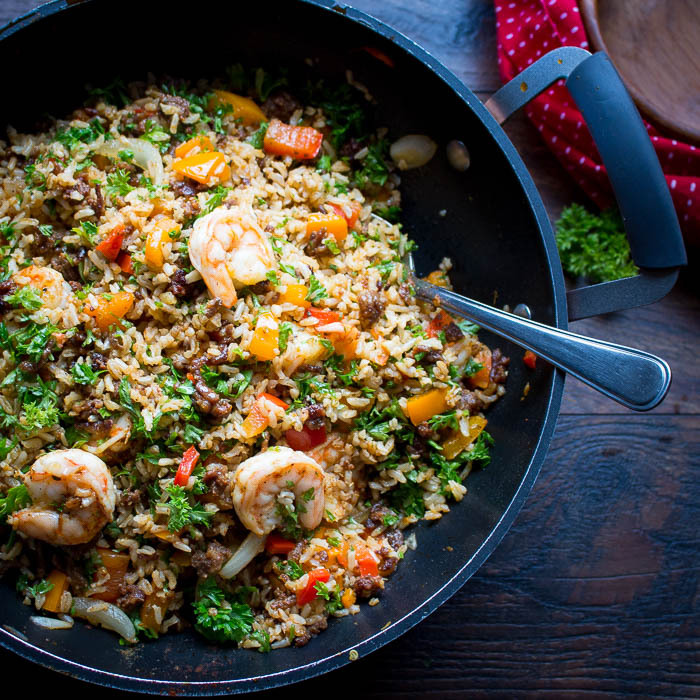 A little spicy, savory, packed with vegetables and crunchy shrimp this stove top dinner idea is sure to please. We cook fried rice several times a week. How about you? Fried rice is one of those fabulous ways to clean out the refrigerator. All those little bits and bobs of vegetables and proteins that are not enough for one person but when added into delicious fried rice make a full meal. If you like this idea, be sure to try our Vegan Curried Rice, Hawaiian Luau Rice, Pantry fried Rice and our Kimchi Fried rice. You are going to have the cleanest refrigerator in town! We know everyone has their thoughts on Thanksgiving and the holidays but what are you going to eat the other 364 days of the year? With crazy hectic holidays in the forecast, you need one sure fire dinner that is fast, delicious and a crowd pleaser. 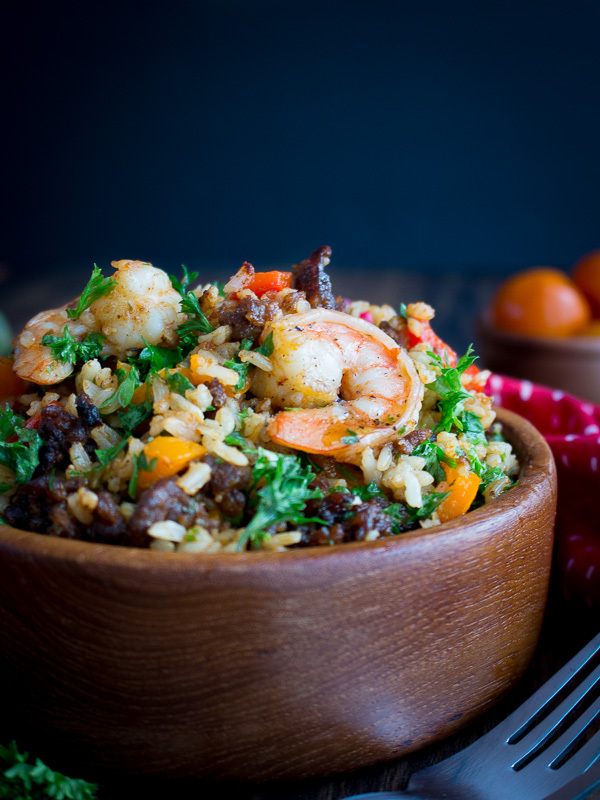 Chorizo and Shrimp Fried Rice is going to be your new go to recipe to keep things simple and easy on those busy days. Why do you need to use day old rice? Day old rice is cold and stays nice with distinct chewy grains. If you start with sticky, warm, just-cooked rice, your fried rice will turn out soggy or even mushy. No one likes mushy fried rice! It is best to cook your rice at least one day in advance. Let the rice cool and dry out a bit so it has a good texture. 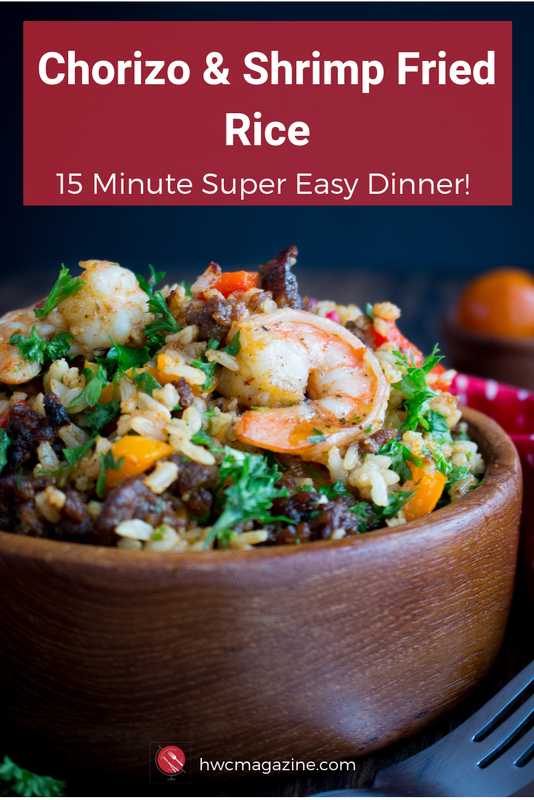 We used simple brown rice for our chorizo and shrimp fried rice but this would also be good with jasmine, short grained, basmati or really any kind of rice you desire. When we make rice we always double the recipe so we have leftover rice for fried rice or soup. 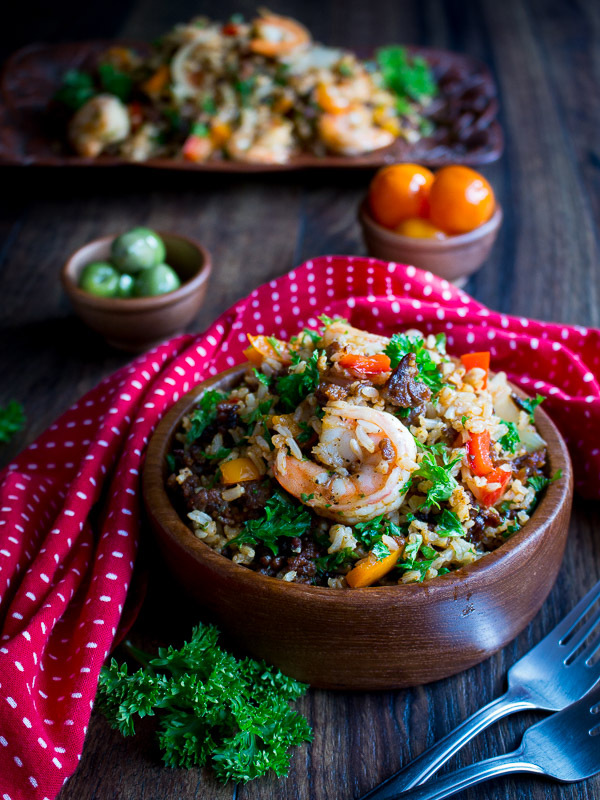 Chorizo and Shrimp Fried Rice is made with fresh gluten free chorizo sausage. If you are looking for a gluten-free brand we found the Johnsonville Ground Chorizo at Krogers and this worked well for us – no issues. This recipe would also be delicious with cured dried chorizo if you desire. The reason why we like to use fresh chorizo sausage as when the chorizo cooks down it leaves this super aromatic spicy oil that is dynamo in the fried rice. We do drain some of that oil but leave a couple of tablespoons to toss through. If you like the taste of spicy chorizo sausage be sure to check out our homemade stuffed chorizo mushrooms. Chorizo and shrimp are a lovely combo. However, leftover Thanksgiving turkey and chorizo sausage are also delicious together. Heck, while you are at it you might as well add in those leftover green beans from Thanksgiving in this fried rice too! In what order should you cook your vegetables? What kind of veggies are in your crisper or freezer? Whatever you have will be delicious in here. We just happened to have peppers and onions are they were fresh and on sale at the market. If you want to use a firmer vegetable like carrots, no problem. However, you will have to cook and steam these in your wok separately for a couple of minutes with a couple of tablespoons of water. Use a lid to steam just until fork tender before adding the other veggies. Softer vegetables like peppers and onions only need a couple of minutes over high heat and a hot wok to cook. You want your vegetables to be a little aldente and have a little crisp to them still as this makes for a more interesting fried rice with the different textures. As a general rule, the firmer vegetables need a longer time to cook then the less firm vegetables. 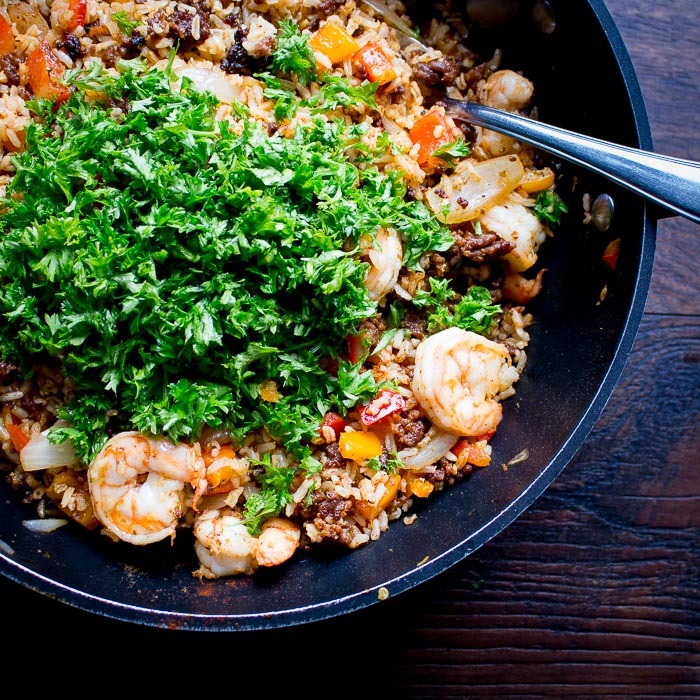 Our chorizo and Shrimp Fried Rice pairs well with our Beef Empanadas and Spicy 5 Minute Chimichurri Sauce for a starter and our Best Orange Almond Flourless Cake for dessert. 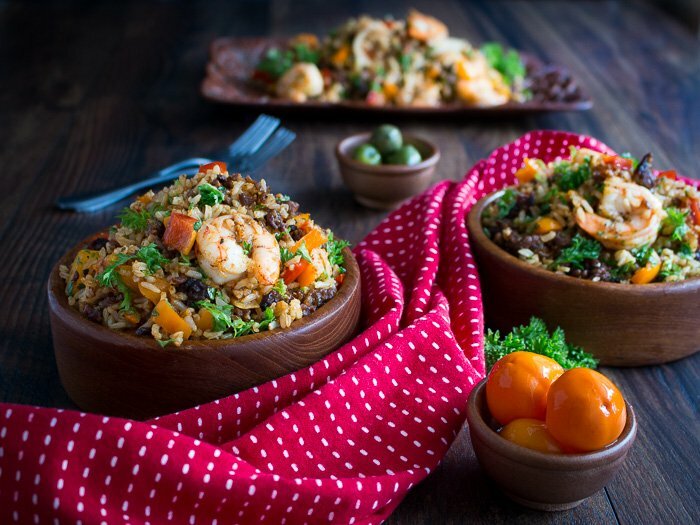 If you are thinking about hosting a Spanish themed party, be sure to check out our Spanish cuisine for some recipe inspiration. There is no need to run and buy a special pan or wok to make fried rice. We prefer a wok as it allows you to cook over high heat and more concentrated heat in the center and less concentrated heat on the side. We make Cantonese fried rice almost every day so we love the wok. However, if you don’t overcrowd or over stuff your pan you can use a large skillet. Don't overcrowd your Wok or Pan! If you need to cook for a large group, then cook in a couple of separate batches. It only takes 5 minutes to cook anyways, so that is not a big deal. The goal of a good stir fry is to cook over high heat and allow the ingredients to sear in the pan. If you over crowd your pan, you are not searing the items but instead steaming them. This can result in mushy rice. Remember, mushy rice is not the effect we are going for. You want little chewy little distinct grains of fried rice and aldente veggies. If your pan is small, cook it in a couple of batches. If you plan to double to recipe, then plan on cooking in a few separate batches. 1In a large wok or frying pan, add olive oil and chorizo ground sausage and cook for about 4-5 minutes or until golden brown. Drain extra oil from chorizo but leave in about 2 tablespoons in wok/pan. Return chorizo back to the pan and back on to the burner. 2Add shrimp, onions, garlic and bell peppers to the wok/pan and cook for about 1 minute just until no longer translucent and pink and the vegetables are aldente. Add the cooked rice, salt and pepper to taste, paprika and toss until well incorporated. Keep your wok moving. 3Add parsley and lemon zest and toss and serve. Enjoy! 4Chef’s notes: If you have a small pan or wok, you will need to cook this recipe in a couple of batches as not to overfill your pan. You can also use chorizo sausage in the casing and remove the casing before frying. If you like your rice spicier, you can add more paprika, dash of red pepper flakes or cayenne pepper to taste. Feel free to use any type of cooked rice you have on hand. We just happened to have cooked brown rice available. Feel free to swap out for any vegetables you desire. If they are firmer vegetable (like raw carrots), they will take longer to cook and you may need to steam with a tiny bit of water in the pan first with a lid before starting the rest of the cooking process, just until fork tender. If using frozen vegetables be sure to just thaw them out slightly before adding them to the wok.